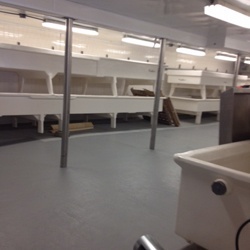 In a cheese manufacturer’s table and brine room, the flooring didn’t slope quite enough towards new drains that were installed in the center of the room. Chemicals, such as alkaline and chlorinated cleaners pooled on the concrete, initiating the gruesome process of concrete erosion. When a floor doesn’t slope properly towards a drain, leftover chemicals and water from a process are left to pool and puddle, ultimately eating away at concrete. 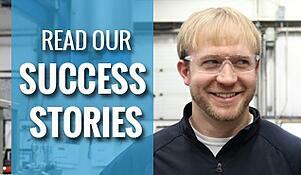 Eroded concrete crumbles, cracks, houses bacteria, and even poses a safety hazard for workers. A cheese plant’s table and brine room is where cheese is stored, processed, and formed. This room is the heart of cheese manufacturing. To address the concrete erosion and drainage issues, the cheese plant’s management team called in the Corrosion Resistance group at Crane Engineering. It was necessary the concrete floor coating be completed during the plant’s downtime, so it was also a race against the clock. The concrete floors were prepared by removing the existing floor topping with a jackhammer and shot blasting the area with vacuum attachments. Next, the floor was given the appropriate degree of slope towards the new drains with grout, so chemicals and water would flow towards the drains and not puddle on the floor. 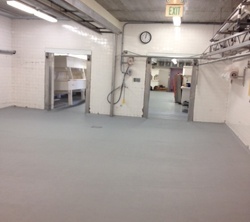 To prevent cracks caused by thermal shock and extreme temperature fluctuations in the area, a thermal shock resistant polymer coating was applied over the grout with a nonskid aggregate to address safety hazards associated with wet, slick floors. To round out the project, a cove was installed around the perimeter of the room to provide a smooth, seamless transition between the floor and wall. This would help prevent liquids from settling in the floor-wall intersect. Finally, the floor was sealed with a chemical resistant polymer coating to protect the floor from any future chemical attack. The job was completed in two phases to allow for equipment movement between rooms, and was done on time to meet the plant’s desired downtime schedule. They could now be sure that chemicals and water would drain properly and not pool and puddle on the floor.